Despite the fervent prayers of conservative Christian groups and small protests outside Jamsil Sports Complex Stadium, Lady Gaga took to the stage Friday night, to the screams of more than 40,000 fans. It was reportedly the largest crowd in the stadium since Michael Jackson held a concert there in 1996. 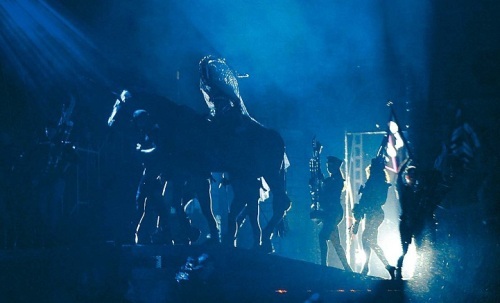 The 26-year-old singer first took to the Gothic castle-inspired stage riding a mechanical horse and donning a warrior-like outfit, complete with metal helmet during “Highway Unicorn,” She then addressed the controversy over the age ban on her concert for the first time since she arrived last weekend. All attendees had to show ID and receive “18 and over” bracelets before being allowed into the stadium. However, groups of teenage fans still showed up to show support for their idol outside the venue. “I was told your government decided that my show was only for those 18 and over. So, I’ll make sure it will be 18 and over,” she declared. And while she avoided the excesses of some of her more famous TV performances, Lady Gaga performed with abandon. Some of the highlights included the singer being dropped into a giant meat grinder during the song “Americano” and opening up “Born this Way” by recreating the opening of her music video where she gives birth to a new race of humans. And no Lady Gaga show would be complete without several elaborate costume changes. The pop star started out in a rhinestone bra and harem pants and completed two costume changes within the first 30 minutes of the show. By the end, she had worn everything from a white puff dress with a large Mardi Gras mask to a piano dress to her infamous flame-throwing bra. Among her hit songs that she performed Friday night were “Just Dance,” “Bad Romance” and “Papparazzi.” The show also included a number of songs from her latest album such as “Heavy Metal Lover,” which was performed while riding a motorcycle around the stage. Made while the singer accompanied herself on a piano attached to the motorcycle, it was a mistake few would have noticed, let alone griped over. The song was written about the singer’s childhood. “My parents didn’t always understand how I used to dress,” she said as she introduced the piece. Between songs, Lady Gaga shared words of encouragement with the audience, telling them to just be who they are. Researcher Ziimaa Gatsanjamts from Mongolia said she wasn’t a big Lady Gaga fan before the show, but now hopes to start listening to her music more. She was impressed with not only the show, but the pop star herself. Meanwhile, Nick, an English teacher, said he’d been a fan for five years, and this was the first time he had seen Lady Gaga in concert. He said his favorite part of the show was when Gaga sang several songs while playing the piano. “It shows that she’s a real artist,” he said. From Seoul, Lady Gaga is taking her show onward to Hong Kong, Japan, Singapore and down to Australia.